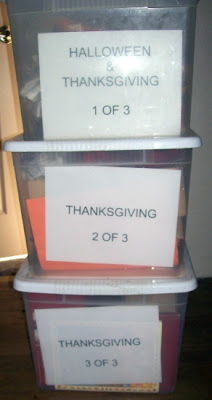 Woohoo finally got the Thanksgiving stuff packed up lol. Haa haaa haa..wow..I have that new wreath centerpiece and 2 orange pumpkin sculptures and one metal pumpkin (that folds flat when unscrewed)...all that "requires storage" is not wanted by DH. I know what you mean. I'm still putting up decorations (putting up and putting away at the same time). Love the signs in the tote boxes. Very organized! You've inspired me to try that when I put the Christmas decorations away this year.